There are 38 Assisted Living Facilities in the Vancouver area, with 28 in Vancouver and 10 nearby. The average cost of assisted living in Vancouver is $3,086 per month. This is lower than the national median of $3,346. To help you with your search, browse the 192 reviews below for assisted living facilities in Vancouver. On average, consumers rate assisted living in Vancouver 4.0 out of 5 stars. Better rated regions include Portland with an average rating of 4.1 out of 5 stars. Caring.com has helped 6 families in Vancouver find high-quality senior care. To speak with one of our Family Advisors about assisted living options and costs in Vancouver, call (855) 863-8283. Vancouver, Washington is a city north of the Columbia River with scenic views of Mount St. Helens and Mount Hood. It provides small-town charm to its senior residents aged 65 years and over, who comprise 14.3 percent of the city’s population. The needs of this sector are served by 28 assisted living facilities (ALF) within Vancouver and an additional 35 in surrounding neighborhoods. The Aging and Long-Term Support Administration (ALTSA), under the Washington State Department of Social and Health Services, issues licenses to ALFs in Vancouver and the rest of the state. Clark County connects Vancouver and nearby cities via the C-TRAN, offering bus transit within the area. It provides fare discounts to riders 65 years and older, which fall under its Honored category. The state of Washington does not collect taxes on Social Security income, withdrawals from retirement accounts and pension income, making Vancouver a tax-friendly city for seniors. Vancouver enjoys a relatively comfortable weather, registering a comfort index of 78 out of 100 (best), which is way above the national index of 54. Winters are generally tolerable for seniors with just 3 inches of snow per year, much lower than the national average of 26 inches. Of the three cities comprising the Portland-Vancouver-Hillsboro metro area, Vancouver is the most affordable, with a cost of living of 114 (based on the US average index of 100) against Portland’s 141 and Hillsboro’s 129. Health cost, which is a main concern for seniors, is pegged at 110 in Vancouver, higher than the national index of 100, but slightly lower than the state’s 113. The city’s Parks and Recreation office has a special program for seniors 50 years and older, known as Fifty and Better. The program offers affordable group travels supervised by volunteers and includes day trips to popular attractions, festivals and cultural events. Community activities are also held at the Luepke Senior Center. The Vancouver area is home to world-class medical facilities, including the PeaceHealth Southwest Medical Center, the Legacy Salmon Creek Medical Center, and the Providence Medical Group, in the event of medical emergencies or illness. Assisted Living costs in Vancouver start around $3,086 per month on average, while the nationwide average cost of assisted living is $4,000 per month, according to the latest figures from Genworth’s Cost of Care Survey. It’s important to note that assisted living rates in Vancouver and the surrounding suburbs can vary widely based on factors such as location, the level of care needed, apartment size and the types of amenities offered at each community. Washington offers Apple Health programs covering all Medicaid and state medical programs. Medicaid programs include the Medicaid Personal Care, and the Community First Choice. The state also offers a Home and Community Based Services waiver program, known as the Community Options Program Entry System, that pays for services in assisted living facilities. Vancouver and the surrounding area are home to numerous government agencies and non-profit organizations offering help for seniors searching for or currently residing in an assisted living community. These organizations can also provide assistance in a number of other eldercare services such as geriatric care management, elder law advice, estate planning, finding home care and health and wellness programs. To see a list of free assisted living resources in Vancouver, please visit our Assisted Living in Washington page. Vancouver-area assisted living communities must adhere to the comprehensive set of state laws and regulations that all assisted living communities in Washington are required to follow. 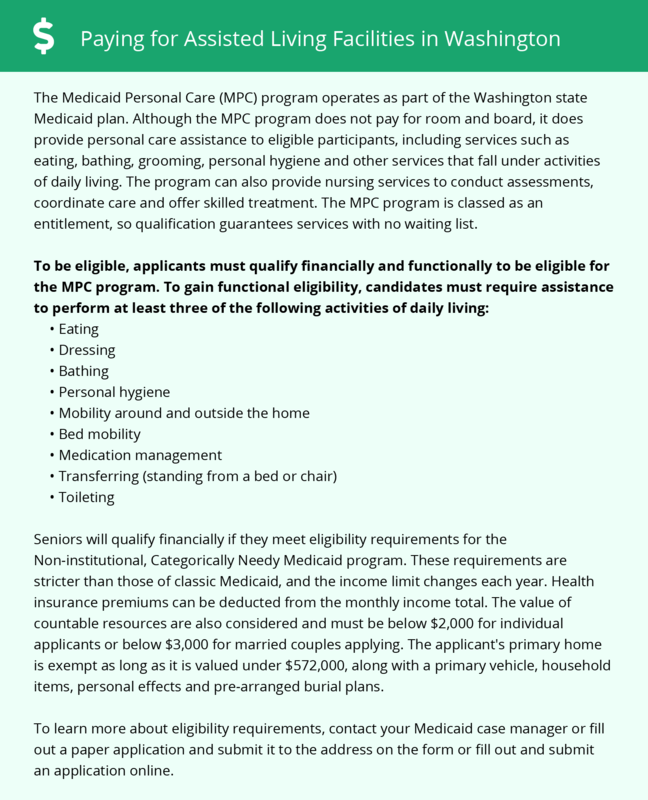 Visit our Assisted Living in Washington page for more information about these laws.